On this day – our Fedex friend pulled up. I wondered what I was getting – (probably a boring textbook). Up the drive he strolled with a beautiful navy blue package. For Me! I shrieked (because who doesn’t love a pretty package from fedex, right?!) and carefully opened this mystery package – i didn’t know the return address. it was too small to be something from my two best girl friends Kate (spade) or Vera (bradley)…and I didn’t think my husband would just make a purchase and mail it to me just because…not my birthday, anniversary… nada. just a day. then I opened it – and inhaled deeply – LAVENDER…. 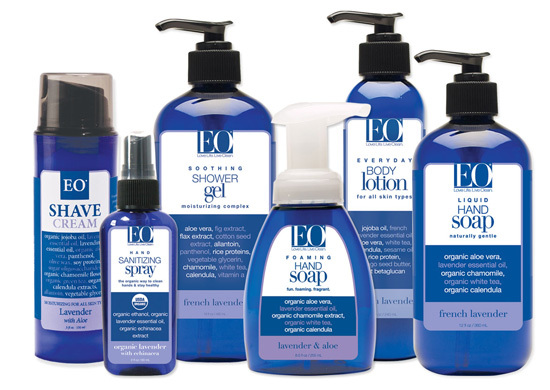 in pretty navy bottles… shampoo, conditioner, hand soap, and body lotion. Wonderful bliss! I didn’t order this – and lord knows as wonderful as my husband is at knowing what I like – I can’t imagine he’d know this. The company is one I was familiar with b/c I had received a little sample of some awesome spray hand-sanitzer (lavender w/ Echinacea)… which has now become my go-to way to sanitize everyone. That night – while the kids were in bed, I decided to try the products. My hair has never been so shiny and smelled so wonderful. The hand soap and body lotion are wonderful to wear ALL day… EVERY day. Just enough to make you feel clean and fresh and ….calm…. I loved the lotion at bedtime – because, duh – lavender is calming and perfect for right after a nice shower and before tucking in for the night.